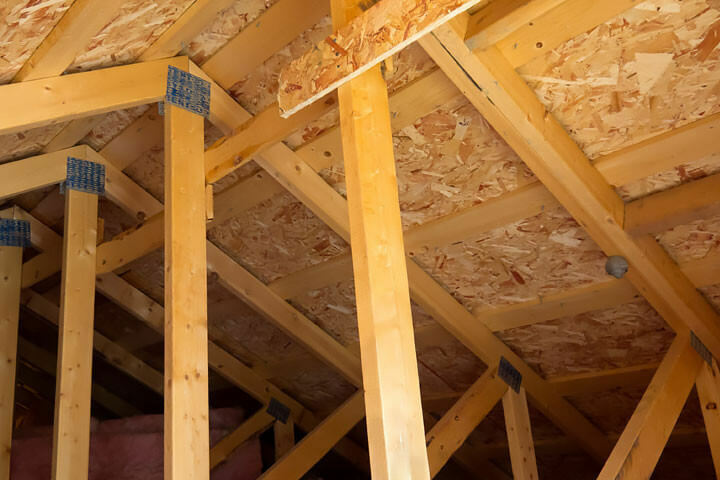 There are two primary roof framing systems used by local home-builders: rafters and trusses, as well as two primary roof shapes: gables and hips. Rafter-framed roofs consist of individual rafters (sawn lumber members), usually spaced from 12 to 24 inches on center, which span from the exterior walls or roof-eaves up to the roof top or ridge, or into the sides of the main hip rafters. This style of roof construction is often called “stick-framing”. The most common rafter size is a 2×6; unfortunately, this small-size member cannot span very far and must typically be braced near mid-span. A structural analysis will usually show that the roof-bracing system picks up most of the roof load (weight). Hence, it is very important that the roof braces land (rest) on only designated interior “load-bearing” walls. Unfortunately, it appears as though many builders/framers do not realize this since they often support the roof bracing systems on the closest or most convenient interior room partition wall. This can lead to long-term floor sag because most floor joists are not sized for roof loads.